Article kindly reproduced from the Herefordshire A7 Club. Part 1 – The crankcase, camshaft, oil pump, rear main housing. 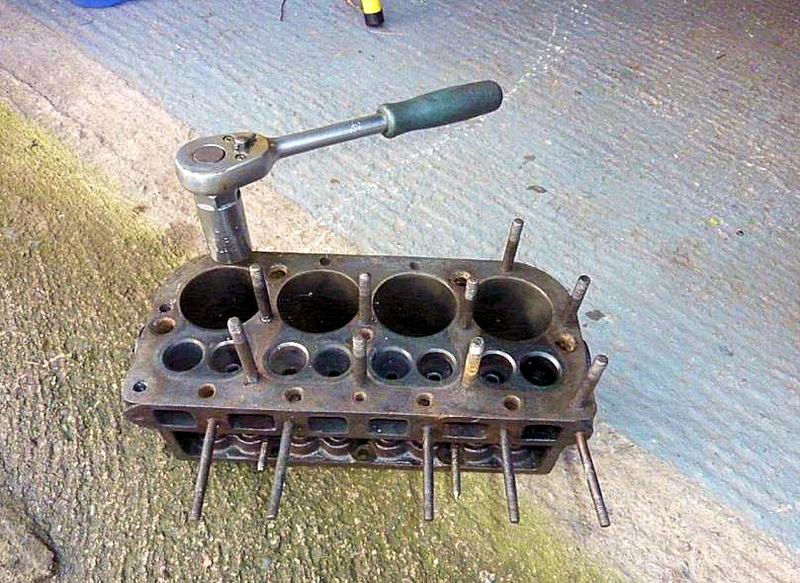 Happily, there still seem to be quite a few Austin Seven cylinder blocks around but sadly they are not all in useable or recoverable condition. Many problems with blocks can be overcome so how do we select one that is suitable for use in an engine rebuild? Well, the first thing I check is that there are no cracks running radially from the centre head stud towards bores two and/or three. This fault is not uncommon and is probably caused by severe overtightening of the head nuts - more of which in a later part of these notes on engine assembly. The centre head stud has less supporting cast iron than the others and is even more vulnerable if the nearby bores have been fitted with liners. Unfortunately, if cracks are present here, I believe the block should be consigned to the bin. First, we need to consider the condition of the cylinder bore surfaces and I check to see if there is any evident damage such as vertical marks or gouges from a loose gudgeon pin or patches of very thin wall. I have seen examples of both and such blocks need to be bored and liners inserted before use. The process of fitting liners definitely requires expert attention to get a satisfactorily result and even then, many builders of sporty A7 engines avoid lined blocks. 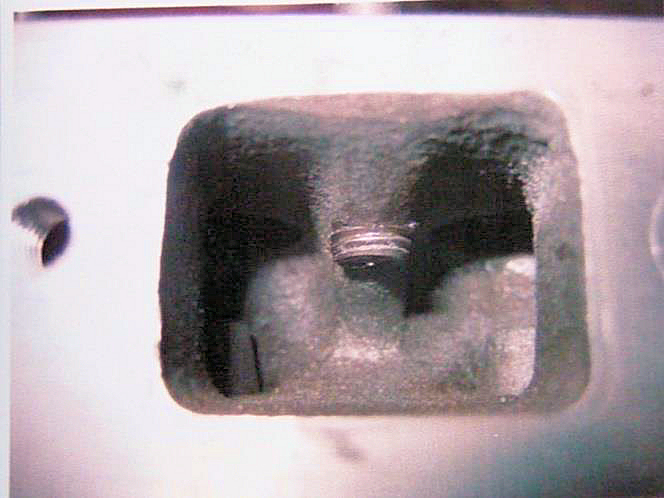 The most obvious indicator of excessive bore wear is the existence of a ridge above the top piston ring on the off-side of the block. A slight ridge can often be honed away but a noticeable ridge might suggest significant wear that requires a re-bore. If the cylinder bore surfaces appear in good shape we next need to check the bore dimensions and if you are the proud owner of a proper bore gauge this is very straightforward. The rest of us probably need to adopt a more basic approach based on measuring the clearance between a piston and the cylinder wall. So, how do we make the necessary measurements? Well, there are four key diameters to measure on each cylinder, the longitudinal and transverse diameters close to the top and bottom of each bore. This can be achieved by using a reasonably well fitting piston together with a set of narrow feeler gauges. Clearly, it is important to use a consistent part of the piston for this process in order to obtain comparable results because pistons often have a variety of different diameters. The aim is to establish any ovality near the top of the bore and compare it with that at the bottom. It is normal to find very little ovality low down in the bores because of generally lower sideways piston loads and better lubrication. The ovality that matters is found towards the top of the bore and some sources recommend a re-bore if the ovality here exceeds twelve thou’ but personally, I would be looking to re-bore the block if this ovality was greater than say six or eight thou’. The other feature of interest is the top to bottom transverse taper because even at 8 thou’, this causes the ring gaps to change by around 12 thou’ twice for each revolution of the crankshaft and I believe this is undesirable. If you decide a re-bore is required, it is important to provide the pistons you intend to use and state the required piston to bore clearance. Also, the bores should be brought to their finished dimensions by honing which gives an excellent surface to hold oil – essential whilst running-in. The studs in A7 blocks are often difficult to remove. This is no surprise, because the buried ends have been in contact with engine coolant (sometimes for many years) thus causing some inevitable corrosion. It is highly unusual to be able to remove studs by using two nuts locked together, unless they have recently been replaced. So, we have to consider other options - and these range from a rather basic approach using a good size ‘monkey’ wrench or Stilson to the various forms of proper stud extractors. Stilsons can be effective, especially if used as a pair at 180 to one another but they will often damage the studs - which of course doesn’t matter if you plan to replace them. Undoubtedly, the best method of removing studs, is by using a proper stud extractor tool and several different socket-drive types are available. The cheaper ones are based on an eccentrically mounted hardened & knurled steel ring that grips the stud and they can accommodate a range of stud diameters. However, undoubtedly the best ones are the ‘roller cage’ type but they are rather expensive and you need a separate one for each diameter. In all cases, it is helpful to lean repeatedly on the socket wrench or drive bar until you eventually feel it ‘give’. The application of heat to the stud can sometimes help release more stubborn examples . 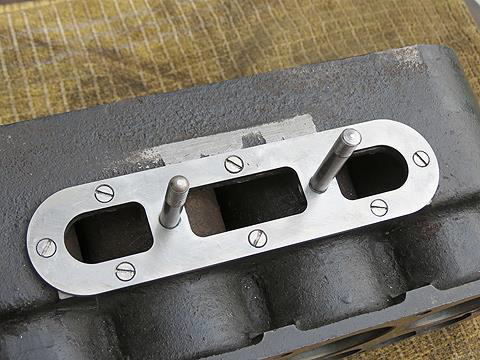 Sadly, despite all our best efforts, it is not uncommon for manifold and sometimes head studs - to break rather than allow themselves be unscrewed - and the break will invariably occur just below the block surface. Now, many books tell us that in this event - you simply centre-pop the broken stud remnant near its centre, drill a suitable hole and use a left-hand screw extractor to remove it. I strongly suspect that these writers are simply repeating something they have read but never actually tried to do it themselves. I’m afraid that I have had only very limited success with this approach. My method of removing broken studs is simple and so-far, has always been successful. 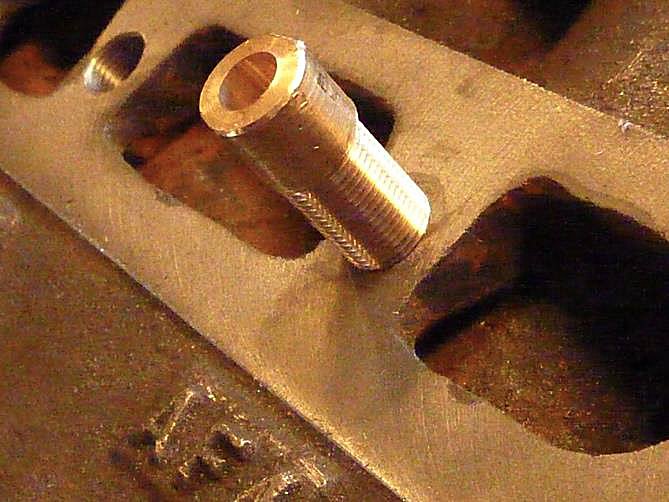 For head studs I use an old cylinder head as the primary jig, in conjunction with a steel guide ferrule sitting in the appropriate stud hole. The remains of the stud should be filed flat with the mating surface if it protrudes, then the head secured in position with at least three or four other studs & nuts before inserting and pressing-down the ferrule and drilling-out the core of the offending stud. Many years ago I turned-up several ferrules to suit 5/16” BSF head studs. 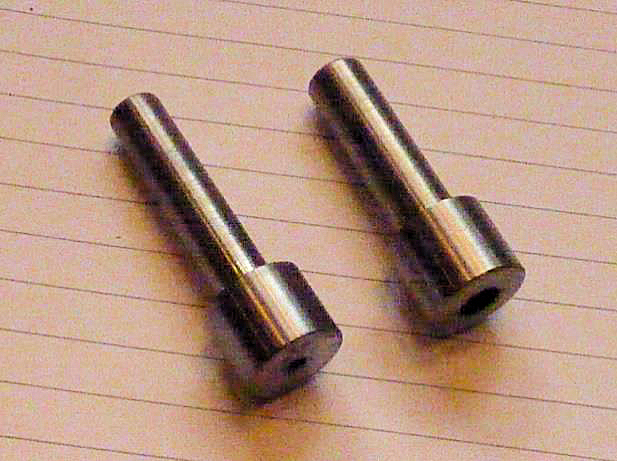 The one shown on the left is 1/8” internal diameter and the outside diameter is sized to fit the 5/16“ dia stud hole in the head. It is important that the ferrule is a close sliding fit in the stud hole and the drill a good fit in the bore, also the ferrule must reach down to the top surface of the block. A second ferrule is then substituted to take a 5/16” BSF tapping drill - 7/64” dia will do. Very often, after drilling, the remains of the old thread will fall-out or easily be coaxed out. Finally, a carefully aligned ‘second’ tap will quickly restore the thread to a usable condition. Broken manifold stud threads can easily be repaired by an entirely equivalent method, with appropriately sized jig ferrules and an old Austin manifold. I believe it is essential that all threads in the block are in good condition, so if you are unhappy with the results of the above process, or the threads are loose, then stepped studs are probably the answer and they are widely available from our usual suppliers. Several other approaches are discussed in Part 1 of these notes. In any event I would always advocate replacing with new - any studs that do not have excellent threads. 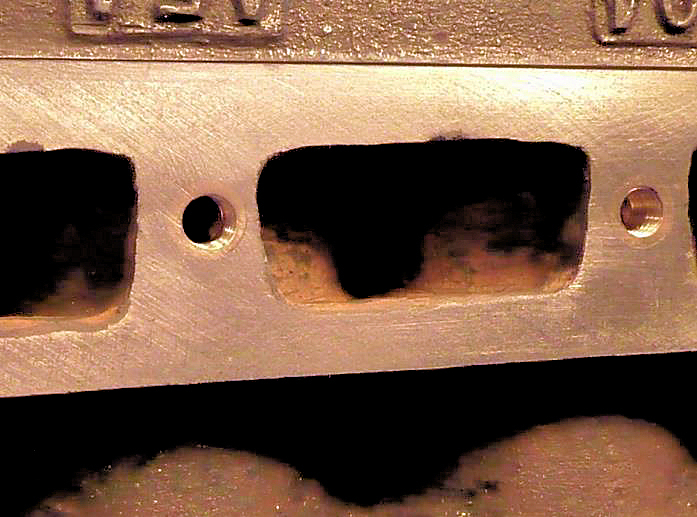 If you are lucky enough to have an early cylinder block with screw-in core plugs – you can skip this section. Unfortunately, the more common ‘knock-in’ core plugs can appear perfectly OK but in-fact be wafer thin due to internal corrosion. So, unless I’m sure the core plugs have been replaced in recent years and therefore known to be sound, I believe it is prudent to replace them with new when rebuilding an engine. It is also much easier to clear the internal water passages of the block with the plugs removed. Core plug removal is normally straightforward - you simply drive a small sharp cold chisel through the centre and lever out the remains. Many years ago I had a core plug fail not long after I had replaced it, and the problem seemed to be a badly corroded housing. So, nowadays, I always ensure the seating is thoroughly sound before assembly. The seat shown here in the photo was machined a little deeper (there is plenty of metal to accommodate this) using a boring head with the block clamped upside-down on the bed of a Myford 7 Series lathe with suitable spacers. This provided a perfect seat. Some new core plugs have a corrosion resistant plated surface but if this is absent, then it is prudent to apply some protection to the inner surface. A two-part epoxy paint would be ideal. The proper installation process for domed core plugs is well known - using a steel drift, slightly smaller in diameter than the plug and the plug placed (concave side down) on a thin bead of 2-part epoxy putty. Then quickly follow-up with a whopping blow from a heavy hammer (sometimes several) but definitely not a series of gentle blows. For core plugs in the block, I adopt a belt and braces approach to completely eliminate the likelihood of any further problems by adding steel cover-plates (see photos). 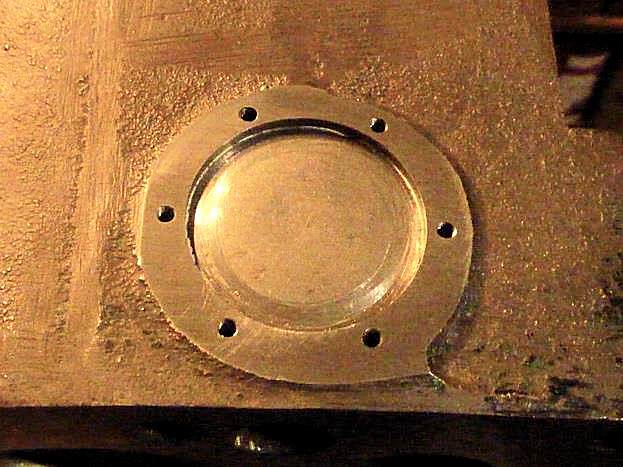 The plates are about 1/16” thick - sealed in position on a gasket smeared with Hylomar and finally secured by six 6BA x 3/8” long countersunk steel setscrews. Yes, I know what you are thinking and I agree - this is probably completely unnecessary but I am determined never to have another a core plug problem! Interestingly, I recently heard of another risk averse engine builder who used to install a second core plug on top of the first - something I’ve never seen in the text books but certainly a lot quicker than my method. The water passages in A7 blocks are often restricted by hard rust deposits which need to be cleared if we are to avoid an engine that boils when climbing long steep hills on sunny days. Most of this obstructing material can be removed by poking around with a hardened blade through the side water inlet opening but the worst affected region is likely to be the ‘hot side’ adjacent to the exhaust manifold. Luckily, there is an excellent article on the A7OC website dealing with this very subject, that recommends appropriate drill sizes and depths to clear this part of the block (and head). It is also important that when the manifold studs are installed, they do not protrude into these newly cleared areas. The cast iron ‘bridges’ supporting the side water inlet mounting studs are often badly corroded. If the ‘bridges’ are largely intact but the 5/16” BSF stud hole threads are in poor condition, it is often possible to drill and tap say 7/16” x 26 TPI and turn-up a pair of bushes (I use bronze) threaded externally to suit and internally 5’16” BSF as shown in the following photos. 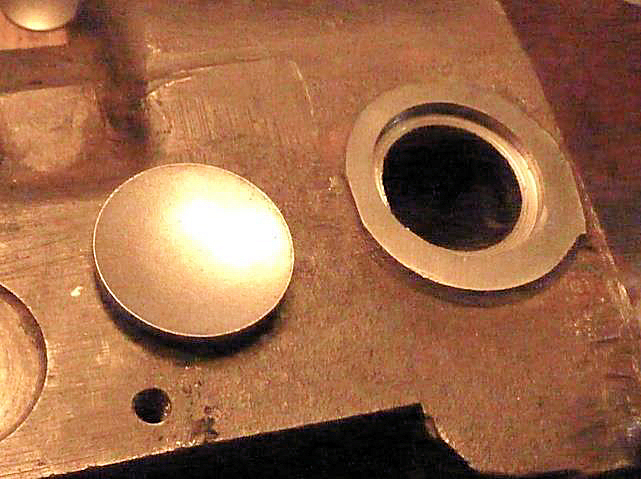 The bushes are fixed in position with high strength Loctite and after curing – cut and filed flush with the flange surface as shown in the photo on the left. I have used this method several times and it has proved entirely satisfactory. However, if the ‘bridges’ are badly damaged or non-existent and you are desperate to retain your favourite block – then all is not lost, because laser cut stainless steel repair plates are now available. There is an excellent article by Colin Danks on the Bristol A7 Club Website …. http://www.ba7c.org/ (with photos by Terry Griffin) that describes in detail the fitting of a repair plate. 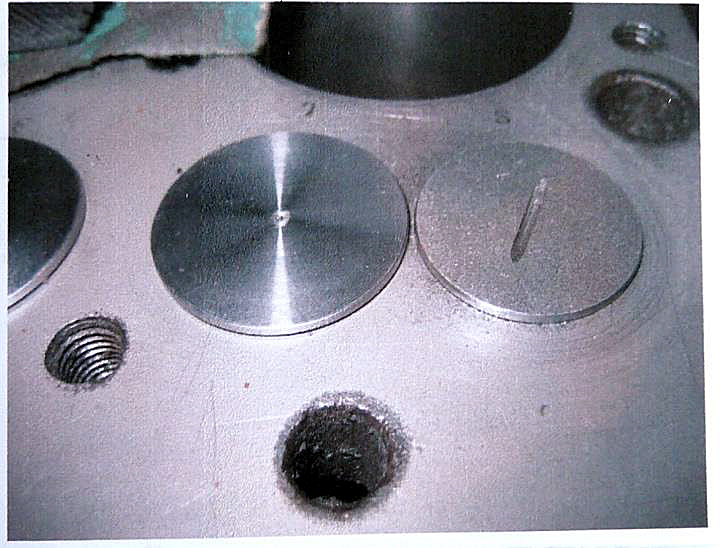 In essence, the plate is fixed in position with stainless steel countersunk set-screws on a gasket with sealant. The plate is not really thick enough to thread for the 5/16” studs, so nuts (preferably also stainless) need to be silver ’soldered’ on the back. Any remaining ‘bridge remnants obviously need to be sawn off to clear these nuts. 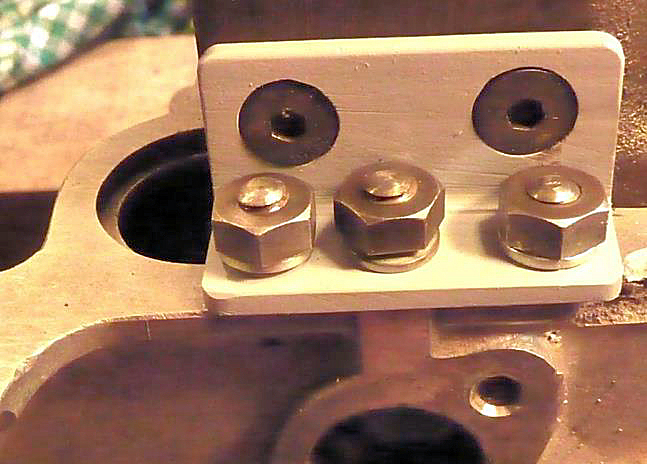 Austin’s standard ¼”diameter manifold studs have always struck me as being slightly flimsy - so, I make mine 9/32” diameter, threaded BSF and make nice beefy 7/16” AF brass nuts to suit. Much better engineering in my view and I like to think that Sir Herbert wouldn’t be too disapproving! The cylinder block is attached to the crankcase by eight 5/16” BSF studs and for normal use with single valve springs and a standard camshaft this is probably adequate so long as the threads in the crankcase are in good condition. However, if like me you like your engine to develop a little more power, you might employ a camshaft that gives a little extra valve lift and to fully exploit its potential, you will frequently want to employ high engine revs which calls for double valve springs. All this suggests to me that those eight studs might appreciate a little help especially in the areas at either end of the camshaft. 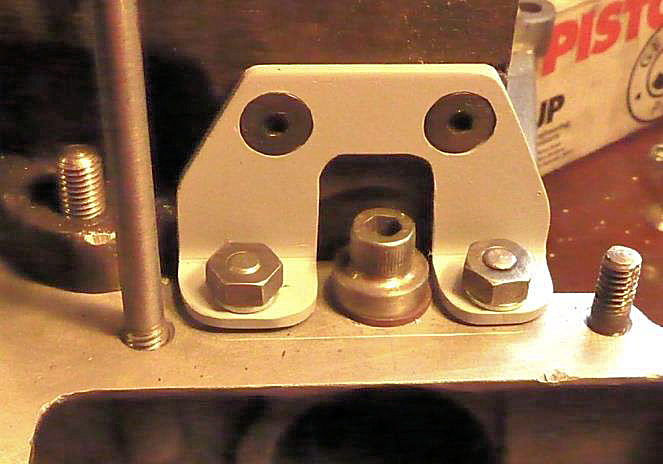 I have seen a variety of solutions over the years that include bolts running from inside the crankcase to different patterns of external brackets some of which struck me as decidedly clumsy. My approach is to attach simple mild steel brackets at the front and back of the engine above the line of the camshaft attached to both the block and crankcase. Although there is not a great deal of space to accommodate such brackets (especially at the front of the engine) or depth of aluminium to secure them, it is possible with care to make and fit suitable items. The examples shown in the following photos are attached to the block by a pair of 5/16” BSF countersunk hex drive setscrews secured with threadlock and to the crankcase by ¼” BSF studs and nuts. The stud spacing of the rear bracket looks somewhat irregular but they were positioned to maximise the available depth of crankcase material. A very approximate calculation suggests that each bracket provides a ‘holding-down’ capacity at least equivalent to an additional 5/16” block/crankcase stud. In any event, it seems to work because I have no oil leakage from the block/crankcase joint despite frequently using high engine rev’s. A great deal of information regarding optimal side-valve port geometry for high revving racing engines, can be found in the 750 Club Companion and Special Builders Guide. Much of this is very interesting reading but for a lively road-going engine, I conclude that generally smooth passages devoid of any sharp steps is all we need. Depending on the choice of manifold, this probably means removing some metal from the outer ends of the ports and making sure the gasket does not intrude. 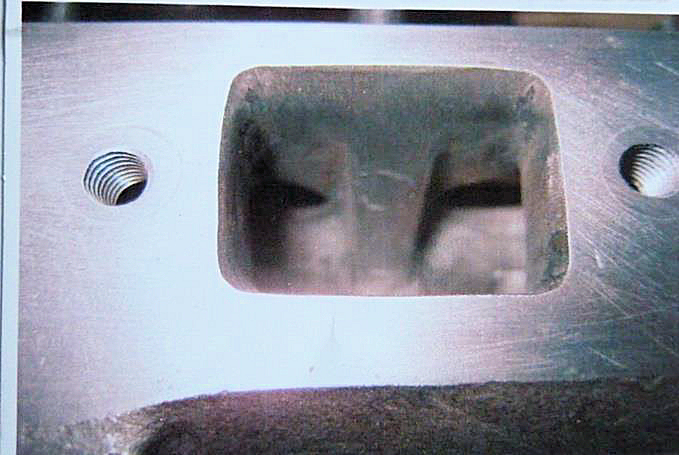 The bottom end of the head stud immediately over the Siamese inlet ports can also usefully be smoothed-off as shown in the following photos. I believe there is no advantage in polishing the ports, a smooth matt finish being more desirable, although this is not the case with the cylinder head and piston crown where a polished finish will offer some advantage. If the valves can be wobbled in their guides to any extent, I always replace the guides with new. The old ones can easily be driven downwards for removal with a suitable stepped drift and new ones inserted the same way, preferably with a copper washer protecting the top surface of the guide. Better practice of course would be to use a simply made threaded ‘puller’. With the new guides in place, it is useful to check that a clean valve slides freely but without any play. If the valve is tight, careful use of an expanding reamer will soon ensure a good sliding fit. Incidentally, the guides should be positioned so that the top surface projects 3/32” into the valve port. The valve seat should be re-cut after installing new guides, removing as little material as possible noting that standard seats are 45 and a seat width of around 0.10”is typical. It seems Sir Herbert believed that standard size valves were fine for A7 engines - and for modest power requirements, I’m sure he was right. On the other hand, if you seek a little more oomph and are willing to run the engine at higher revs, then fitting larger inlet valves is pretty straightforward. 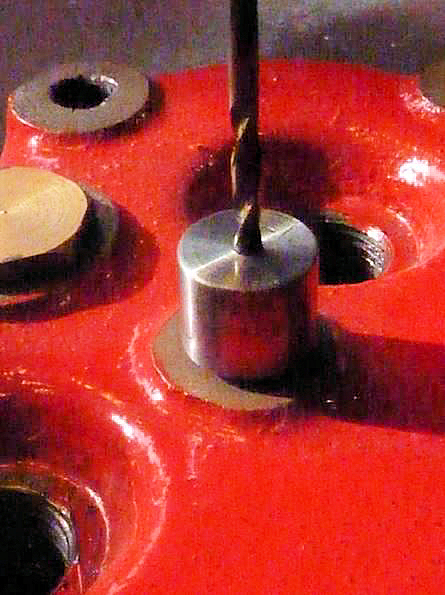 A 1.00”dia cutter with a 0.275” dia mandrel to fit the valve guide is run at slow speed to cut a depth of around 5/8” and the bottom of the cut blended into the port with a rotating grind stone. A new valve seat is then cut in the top face. This can with advantage be cut at 30 and only a narrow seat of say 1/16” width is needed, because the incoming mixture tends to keep the valve and seat a good deal cooler than the exhaust. Large inlet valves are available from our suppliers and the heads are typically 1.142” (29mm)dia. 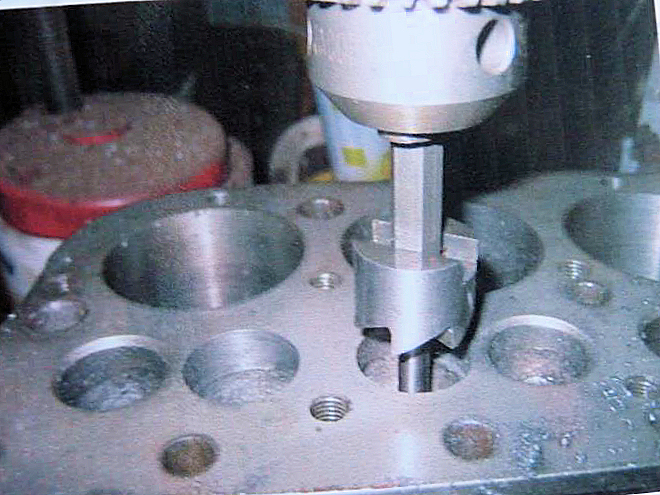 I make sure there is a clearance between enlarged inlet and standard exhaust valves on assembly of around 10 thou and this can be achieved by carefully turning down the inlet valve head in the lathe. Incidentally, whilst using the lathe, the top edges of enlarged inlets can usefully be slightly rounded to improve gas flow into the combustion chamber. This can be seen on the top valve in the photo also the much wider seat on the lower standard size exhaust valve. I definitely favour valves secured with cotters rather than pins because many years ago, I had a pin shear. I also use double valve springs with cotter cups to suit, which allows the engine to achieve high rev’s whilst eliminating the chance of any valve bounce. If you consider the many changes of direction of the gas path from the inlet port, up past the valve, across into the combustion area then back out, it will be no surprise that some rounding of the top right-angle edge of the bore will help matters. The theory of fluid dynamics suggests that even a very small rounding will make quite a difference. The key limitation is of course the position of the top compression ring at TDC and this is determined by a trial engine assembly then allowing say an extra 20 thou’ to be safe. Also, the width of any chamfer is obviously limited by the head gasket dimensions. The low compression Austin cylinder head is not usually associated with performance and often believed to respond poorly to skimming in an attempt to extract more power by increasing the compression ratio. Nevertheless, I have observed one or two early lightweight Sevens performing remarkably well with skimmed low compression heads. Received wisdom tells us that the higher compression (originally 5.8:1) ‘1937’ head enjoys a far superior combustion chamber shape and in my experience it does seem to offer more power, although I have never tried a skimmed low compression head. Original Austin cylinder heads have now been around for rather a long time and it is sometimes difficult to tell whether they have been skimmed and if so, by how much. There is an excellent article on this subject to be found on the Bristol A7 Club Website but it can be useful to know that original heads were believed to measure within 10 thou of 1.50 inches in height when they left the factory. Bill Williams also cautions us not to take the compression ratio (CR) above 7 to 1 and don’t forget that increasing the bore will also increase the CR. I will return to this subject in the final part of these notes on engine assembly, because the compression ratio is also affected by the thickness of the head gasket. A variety of alloy heads are available for our engines but I only have first hand experience of the Speedex and Supalloy offerings. Both seem to provide a power output similar to the 1937 Austin head but have the advantage of being considerably lighter. However, if you aspire to compete in VSCC events, you might find you are restricted to the Watmough Hewitt head with 18mm plugs. I have heard fears that alloy heads distort and regularly need re-facing but this is most definitely not my experience. Just for the record, I have been using a Supalloy head (estimated CR of around 6:1) for over ten years without any problems. 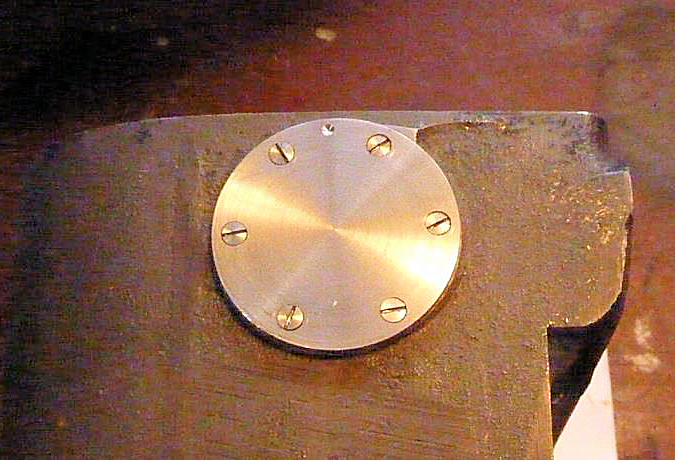 When fitting the starter housing , you must fit the locating dowels because these take the strain from the mounting set pins . The mounting set pins will always work loose if the dowels are missing , there is quite considerable torque reaction when the starter is actuated thus the importance of the dowels. There is another reason for fitting these dowels, they help to maintain correct alignment between starter teeth and flywheel teeth. Because the starter housing is mounted directly to the crankcase, the set pin threads are machined into soft aluminium so will quickly wear if there is movement between housing and crankcase, to effect a repair to possible damaged threads will always involve engine removal .